Home » Radio » Ham Radio » Is It Time to Rename Amateur Radio? Is It Time to Rename Amateur Radio? Bob gave me a new Amateur Radio mug for Christmas. It falls short of trying to rename amateur radio, but does a great job of re-branding. Every few years, my friend Bob comes up with a ham radio related Christmas gift. This season, it was a couple of amateur radio mugs and one really caught my attention. 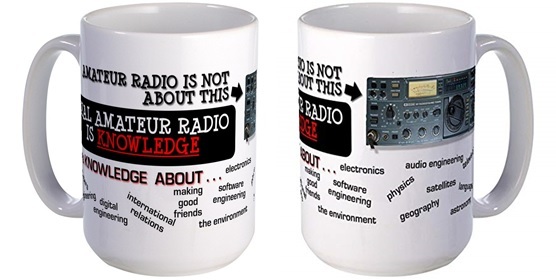 Basically, the mug says that real amateur radio is knowledge. All sorts of knowledge, some technical, some social. And that’s true. First time I ever found myself agreeing with a mug. And that all got me thinking that our hobby’s name is no longer that meaningful. Ham radio. Amateur radio. Terrible names. If you study the history, the origin of “amateur radio” is clear. The name was meant to differentiate radio hobbyists from commercial and professional radio. A hundred years ago, this was an important distinction when the technology was new. Hobbyists were not the professional scientists or engineers trying to establish their roles. Guys communicating from their basements were not the same as professional radio operators working on ships or sending telegraphs. Although licensed, amateur radio operators needed to be differentiated from commercial operators who received compensation for their services. You will find many of the amateur radio regulations are still, to this day, quite explicit about defining the hobby as non-commercial and not not able to receive compensation for services. If you think about human behavior, you will notice that we like to label things. And once entrenched, labels tend to stick around for a long time. So we have been amateur radio operators for about 120 years, and hams for a century. Ham radio as a label is even stranger. No one really knows where it came from but it simply won’t go away. Rename Amateur Radio – Okay, but to what? I really don’t know. We could be called non-commercial radio operators, but that does not really encompass enough of what we do. And non-professional radio operators has negative overtones. Perhaps we should just join the hacker or maker communities. But most hams operate rather than hack or make. Looking at antonyms for professional, amateur is perhaps the most benign term. Would you really prefer inept radio? We are amateur in the sense that we are not paid for our activities, just like amateur athletes. Radio Hobbyists as a terminology probably comes the closest. So perhaps we are stuck with these sticky descriptions and we just need to work on re-branding. And that’s what the Real Amateur Radio is Knowledge mug tries to do.